Also known as K. R. Narayanan, was the tenth President of the Republic of India. He is the only Dalit and the only Malayali to have held the Presidency. Born in the southern state of Kerala, and after a brief stint with journalism and studying political science at the London School of Economics with the assistance of a scholarship, Narayanan began his political career in India as a member of the Indian Foreign Service under the Nehru administration. He has served as ambassador to Japan, United Kingdom, Thailand, Turkey, People's Republic of China and United States of America and was referred by Nehru as "the best diplomat of the country". He entered politics at Indira Gandhi's request and won three successive general elections to the Lok Sabha and has served as a Minister of state in the Union cabinet under Rajiv Gandhi. 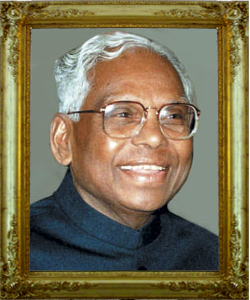 Elected as Vice-President in 1992, Narayanan went on to become the President of India in 1997. In India, where the office of the President is largely ceremonial without executive powers, Narayanan was regarded as an independent and assertive President who set several precedents and enlarged the scope of the highest constitutional office. He described himself as a "working President" who worked "within the four corners of the Constitution"; something midway between an "executive President" who has direct power and a "rubber-stamp President" who endorses government decisions without question or deliberation. He used his discretionary powers as a President and deviated from conventions and precedents in many a situation including but not limited to— the appointment of the Prime Minister in a hung Parliament situation, in dismissing a state government and imposition of President's rule there at the suggestion of the Union Cabinet, and the Kargil conflict. He presided over the golden jubilee celebrations of Indian independence and in the country's general election of 1998 became the first Indian President to vote,setting another new precedent. K.R. Narayanan Foundation founded in December 2005, is aims at propagating the ideals and perpetuating the memory of K.R. Narayanan.K.R. Narayanan Foundation (KRNF) is a mission of collective action to provide better future to the most vulnerable sections of Kerala Society - women, children, disabled persons the aged and other disadvantaged groups - by providing educational training, protecting their health and environment, improving their living condition and strengthneing their family and community. The paradigms of KRNF revolves around five crucial elements, research and development on science and technology for the dissemination of eco-friendly rural technology to the poor, human resource development, attitudinal change and self management, and economic empowerment to the poor. The Foundation is to identify and honour the best in areas of national importance like Integrity in Public Life, Journalism, Civil Service, Medical Science, Social Service, Literature, Sports, Entertainment, Politics etc. There are no condolence Messages.